SQUID, SQUID BASE, SQUID LOC, originally uploaded by James Mulryan. So, does anyone have any idea what these are referring to? It’s on the west bound A59 just north of Skipton, North Yorkshire – as per the marker on this map. We drive past it every day, it’s been there for months and it’s really starting to bug me now. Good friend of DragonDrop James Mulryan shot the above as part of a failed quest at the weekend to find the destination that the signs are so boldly advertising. 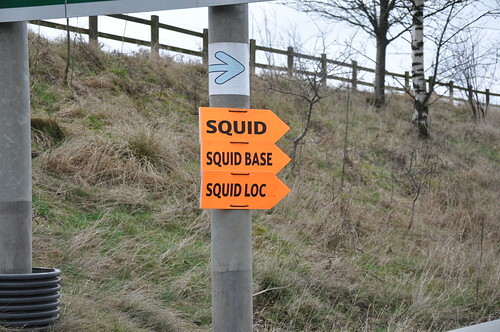 James ended up near Leyburn apparently, without seeing so much as calamari ring, let alone a whole base of squid. At the time of writing this google only comes up with this actual photo, when you search, (and shortly, I imagine, once this page has been indexed, this page will appear top when you search for squid squid base squid loc. etc) – neither of which give me anything useful, as to what the squid is going on. It’s for a TV shoot – probably an ITV production. BASE will refer to the main base for the crew and the LOC the location they’re filming at. They deliberately keep them cryptic to stop the public turning up and gawking. I suspect the prog’s initials are SQUID. Follow the LOC signs and see what’s happening, Matt! @dragondrop sounds like classic (but rare) negative casualty reality loop. By observing the phenomena you’ve altered the resulting timeline. Getty’s idea also sounds like it holds water (bdtssh!). Interestingly (coincidentally) SQUID is also an acronym for some Sensitive QUantum Interference Device. “love thy neighbour” a reality show on Channel4 that auditions various characters for ultimately a new life in a pretty stone cottage, it is set in Grassington. This weeks contenders are a trampy life model versus a lesbian couple. Squid is prolly just a random word. I still like the idea its a quantum disturbance machine buried under the dales, messing with our minds though. The lesbians appear to be winning this weeks trial by tellybox. Which is nice.